Philips HDT8520 review | What Hi-Fi? 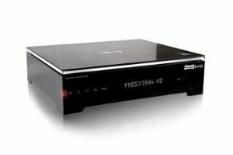 It says ‘Philips' on the front of the HDT8520, but this is actually built by Pace, a company well known for its set-top boxes, including some of the many Sky HD units around. It certainly looks like a Philips product, though, thanks to a smart, premium-looking design, a clear, detailed display and a well laid-out remote. It's got a premium spec, too, which includes a 500GB hard disk and a twin tuner that actually lets you record two channels and watch another. But like many rival products, it doesn't yet compliment its HD pictures with Dolby Digital 5.1 sound, although Philips has confirmed it's working on fixing this with a firmware upgrade due in September. After a straightforward setup, Stand Up for the Week on 4HD gave us a lovely picture. There's a smidge of extra red to the colour balance; though that means it's not precisely neutral, it does introduce an extra degree of vitality to faces. It's detailed and sharp, too, and when you switch to the standard-definition Sky Sports News, the Philips remains controlled and punchy. We only have a couple of niggles, really: you can't page-up or page-down the EPG using the channel up/down buttons, and there's no picture-in-picture for you to see what's on screen while you look for other programmes. Forum members on whathifi.com have mentioned other minor bugs, but we didn't experience them – and anyway they should be ironed out in a September update.